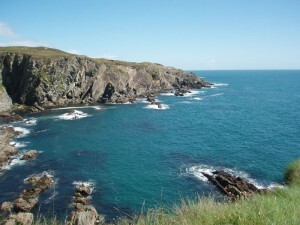 All sea cliffs in Ireland are included within the EU Habitats Directive Annex I habitat Vegetated sea cliffs of the Atlantic and Baltic coasts (1230). Vegetated sea cliffs can be divided into two broad categories: hard cliffs and soft cliffs. Different plant communities occur on sea cliffs in horizontal zones, from maritime communities at the cliff base to Festuca-dominated grassland at the cliff top. This project, which commenced in 2009, developed and refined methodologies for surveying and assessing the conservation status of sea cliffs in Ireland. There were two parts to the project. The first was a desk-based study of all available information on the 196 sea cliffs in Ireland which had been identified prior to 2010, and the second was a detailed field-based investigation of the area, vegetation, management and threats to a sample of 31 Irish sea cliffs. Information relating to cliffs was presented in an access database, and vegetation data were stored in a Turboveg database. During the desk study, a further 140 sites were identified and mapped. A combination of vegetation and environmental factors provided the basis for a preliminary classification system of vegetation communities of Irish cliffs. The national distribution of sea cliffs in Ireland, the location of survey sites and vegetation communities present at those sites was shown on maps produced using ArcGIS. This project assessed the current conservation status of Irish sea cliffs and provided baseline information, which will allow trends in conservation status of Irish sea cliffs to be monitored into the future. Barron, S.J., Delaney, A., Perrin, P.M., Martin, J.R. & O’Neill, F.H. (2011). National survey and assessment of the conservation status of Irish sea cliffs. Irish Wildlife Manuals, No. 53. National Parks & Wildlife Service, Department of the Environment, Heritage and Local Government, Dublin.